Try this summer salad from chef Jason Hua of The Dutch. Chef Andrew Carmellini's buzzy SoHo institution, The Dutch, is best known for its well-stocked oyster bar, tasty pastas, fresh pies made daily and hot fried chicken with honey butter biscuits and slaw (don’t miss it in our NYC Ultimate Fried Chicken Guide). During the summertime, executive chef Jason Hua serves a popular salad featuring tomatoes and peaches during the peak of their season. 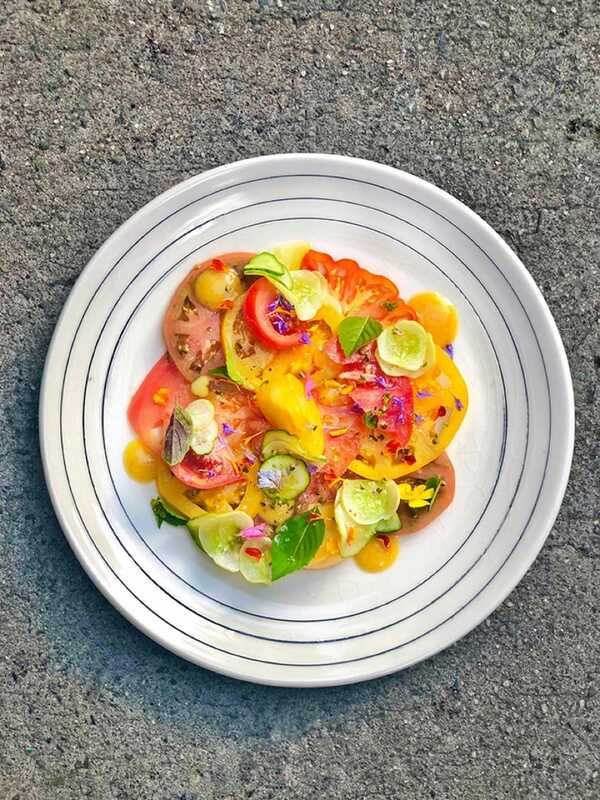 Hua’s heirloom tomato salad is served with cucumbers and basil in a peach vinaigrette, making it a great appetizer for all of your end-of-summer dining needs. 1. Prepare the cucumbers: Sprinkle the sliced cucumbers with the salt. Let sit in slotted pan in the refrigerator for one hour; drain the liquid. 3. To serve: Arrange the tomato slices in a circle on a plate. Season with the sea salt and black pepper. Dress the drained cucumber slices with some of the peach vinaigrette and arrange on top of the tomatoes. Drizzle the tomatoes with the remaining peach vinaigrette. Garnish with fresh basil leaves to finish. *Note: If you can’t find Silver Slicer or Adam Gherkin cucumbers, any other organic cucumbers will do. Make this dish from Sababa's executive chef Ryan Moore at home. Up your taco game at home with this recipe from Oxomoco’s Justin Bazdarich. There’s no time like the present when it comes to making a flavorful soup or stew.